The Wild west Retreat has so much to offer, you may not want to leave. Our beautifully landscaped grounds, friendly hosts, and cozy decor are just a few of the many amenities you'll find while staying with us! Enjoy our unique vacation homes as you use Escalante as your home base while you explore the Canyons of the Escalante in the Grand Staircase National Monument. You'll delight in the privacy and quiet of the Escalante Community. 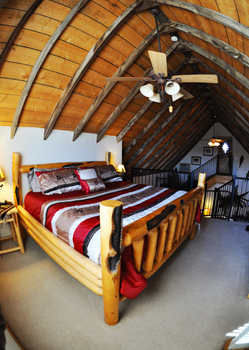 Open Year round, the barn sleeps up to 5,The barn features a full kitchen, bathroom, upstairs loft bedroom with a incredibly comfortable king size bed, downstairs futon sleeper sofa, and a private balcony, and a large patio with a barbaque grill. The barn is beautifully decorated with log furniture authentic southwest accents such as Indian drums and a mountain lion wall hanging the fully equipped kitchen allows you to lounge in front of the wood stove while you drink your morning coffee wrapped in the soft cotton bathrobes provided. Owners Shannon and Jenifer Steed have completly remodeled this 1930's pole barn into a private cabin getaway. Don't miss an opportunity to enjoy the wide-open spaces, peace and quiet, and the most beautiful landscape in southern Utah. 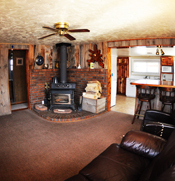 Visit the Photo Gallery for your walk-through of the cabin. The 3 bedroom, 1 bath home is surrounded with lush lawn, fruit trees, historic barns, and the Cabin. Have your family reunion here with the cabin, lawns, dutch-oven dinners and the works. A weekend you'll never forget.